In the end, it was a tale of two outstanding saves; one from Brewers keeper Michael Ingham to unbelievably deny Boro’s Michael Coulson from point-blank range in the first half, before Tommy Taylor somehow kept out Chris Howarth’s header in the dying embers. 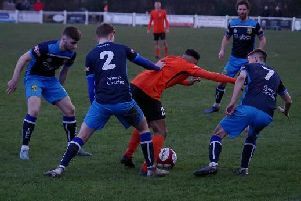 The re-arranged Easter Monday fixture was an entertaining spectacle, and saw two very good Evo-Stik North teams battle it out fiercely. And the well-earned point is another to add to Albion’s tally, but they slip out of the provisional play-off places after Colwyn Bay’s 3-0 victory over Prescot Cables. Taddy bosses Michael Morton and Simon Collins made one change to the team that thumped Bamber Bridge last time out as Will Annan came in for his first start, replacing Casey Stewart. The winger who is on-loan from Championship side Hull City, was introduced mid-way through the second half in last week’s eye-raising victory and scored twice as well as setting up one, and it was he who had the first strike at goal. Aiden Savory cleverly used his body to hold off a Boro defender before teeing up Annan, but he dragged his shot narrowly wide from outside the penalty area. With just four minutes gone, it was one effort apiece as the visitors squandered a good chance to take an early lead. After taking a free-kick quickly, Tom White curled onto the head of Sam Hewitt who powered narrowly wide of Taddy’s right-hand upright. In an even opening quarter of few clear-cut openings, Chris Howarth and Savory both saw their efforts comfortably held by Boro stopper Taylor in the space of two minutes. However the moment which was the main talking point after the full-time whistle came on 27 minutes when Taddy gloveman Ingham denied former York City team-mate Coulson with a quite astonishing save. The effervescent Max Wright clipped an enticing cross into the box which dropped perfectly for the prolific frontman, who strolled in unmarked and guided goalwards from six yards out. A bulge in the back of the net looked inevitable, but the giant Northern Irishman somehow managed to keep the shot out with a strong left hand, showcasing his outstanding reactions. The visitors went on to shade the first 45, but Albion still enjoyed many bright moments, none more so than just after the half-hour-mark, as a devastatingly slick counter-attack almost led to a goal. Ingham threw sharply out to Annan, who confidently burst past Jack Johnson before Howarth cleverly set Billy Whitehouse away in space down the right. The wideman hung up a cross towards the back post, but it was brilliantly cleared away from Savory by the aforementioned Johnson. Similarly to last week’s success, the Brewers began the second period positively and on the front foot. Corey Roper clipped a divine ball in behind Boro’s back-line, timing it perfectly with the midfield run of Howarth who surged away but couldn’t lob Taylor. The hosts continued to look dangerous on the break as Annan threatened once again. 18 year-old right-back Harry Sheppeard opened his electrifyingly quick legs to fly down the wing before the ball eventually ended up with Annan on the left-hand side, but his low drive was halted by Taylor. Midfield maestro Pete Davidson was next to go close for Albion as his forceful curler shaved the crossbar. The visitors may have had the lion’s share of the play in the first half, but the second period belonged to Taddy as the centre-back pairing of Jason Mycoe and Josh Barrett defended immensely to keep the experienced Coulson and James Walshaw quiet. The introduction of Stewart injected even more vibrancy into Albion as his hunger to run at the away defence gave the watching on home fans hope of a late winner. Tadcaster certainly looked the more likely side to pinch a decisive goal going into the final 10 minutes and they thought they had it, but gloveman Taylor had other ideas. Stewart’s brilliant dink to the back post was headed back across goal from close range by the ever-impressive Howarth, but the Boro custodian managed to push up and away to safety, and this proved to be the last piece of action of the night.